I know sis' huh, yeah, wooh ! On a radio station in this the city ? Initial recording by Mark Tolle and Al 'Bongo' Shaw. "I'm a leaf on the vine of time..."
Top left: "Black bones are the original bones...". The science of finding and identifying man's 'prehistoric ancestors' runs in a predictable pattern. A press conference is announced, the discovery of an ape-like 'ancestor' revealed with an artist's impression of what the creature looks like, and the discoverer becomes famous, earning money on lecture tours. The actual fossil bones are scanty and the imagination runs wild. Later, when more evidence is found, the 'ancestor' turns out to be totally human or totally ape. The Neanderthal man is one such example, turning out to be fully human. Once this find is removed as an intermediate form, you can expect another great discovery to save the day. One of the most recent is an australopithecine named 'Lucy', discovered in Ethiopia in 1974 by Dr. Donald Johanson (and preserved at the National Museum of Ethiopia in Addis Ababa). If you are of the impression that there are many intermediate ancestors to man, take note of the following statement by Dr. Lyall Watson, an expert in the field: "The fossils that decorate our family tree are so scarce that there are still more scientists than specimens. The remarkable fact is that all the physical evidence we have for human evolution can still be placed, with room to spare, inside a single coffin !". This is still an exaggeration, since it concedes that various specimens are part of human evolution. Australopithecines, for example, are not considered transitional forms anymore, but a branch of the primate evolutionary tree. True transitional forms (those creatures which represent intermediate states of development for a supposed ape-like ancestor down to man) are still missing. Lucy is a partial fossil skeleton, about the size of a chimpanzee, supposedly female. It is more complete than most fossil finds in that about 40 percent of the bones of the body have been recovered. The age is 'estimated' to be 3.2 million years. The find includes a V-shaped jaw, part of hip and large bones, and other assorted bones with very little skull fragments. What basis is there for the claim that this creature is a transitional form ? According to Dr. Johanson, she walked upright ! Her brain size is still small, ape-like in proportion, and most of the other features are predominantly ape-like. Anatomically it is not different than a modern chimpanzee. The jaw, in particular, is distinct in that it is V-shaped, unlike human jaws. What evidence is offered to support the claim that this creature walked upright ? The angle that the upper leg bone makes with the lower leg bone at the knee. Looking head on, chimpanzee and gorilla legs have an angle of 0 degrees. Humans have an angle of about 9 degrees. If the angle is much greater it gives a 'knocked kneed' condition in humans. Lucy and the australopithecines have a larger angle of about 15 degrees. Does this make her an upright walker ? Present day orangutan and spider monkeys have the same angle as humans yet are extremely adept tree climbers. It is worth noting that there were other finds at the same location (other skulls and U-shaped jawbones). Furthermore, the knee bones were actually discovered about a year earlier than the rest of Lucy, about 200 feet lower and two to three kilometres away. 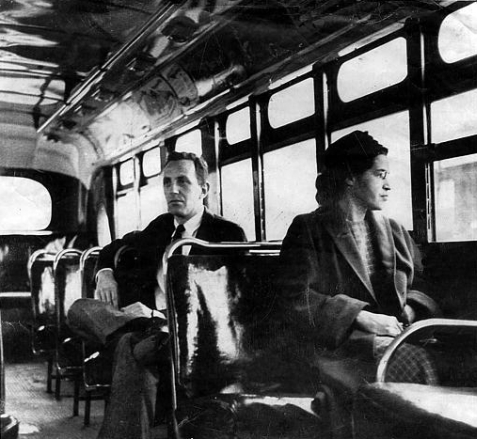 Top right: Rosa Parks on a Montgomery bus on 21st December 1956, the day after Montgomery's public transportation system was legally integrated. Behind Parks is Nicholas C. Chriss, a United Press International (UPI) reporter covering the event. Two hours after the arrest of Rosa Parks on 1st December 1955, she was released on $100 bail. By midnight, a plan had been hatched for a citywide bus boycott, which a young Baptist minister named Martin Luther King, Jr. would later be elected to direct. The boycott lasted 381 days, until the Supreme Court ruled that segregation on buses was illegal; this was the 'daybreak' of the Civil Rights Movement. "I just want to say, you know, can we all get along ? Can we get along ? Can we stop making it horrible for the older people and the kids ? It's just not right. It's not right. It's not going to change anything. We'll get our justice. They've won the battle but they haven't won the war. We will have our day in court and that's all we want. Please, we can get along here. We all can get along. I mean, we're all stuck here for a while. Let's try to work it out. Let's try to beat it. Let's try and work it out." Top left: Screenshot of footage of Rodney King being beaten by Los Angeles Police Department officers on 3rd March 1991. The racism still prevalent in America was transmitted worldwide in March 1991, when Rodney King, a Black American, was the victim of police brutality committed by LAPD officers. A bystander, George Holliday, videotaped much of the incident from a distance. The footage showed LAPD officers repeatedly striking King with their batons. A portion of this footage was aired by news agencies around the world, causing public outrage that raised tensions between the black community and the LAPD, and increased anger over police brutality and social inequalities in the black/African-American community. 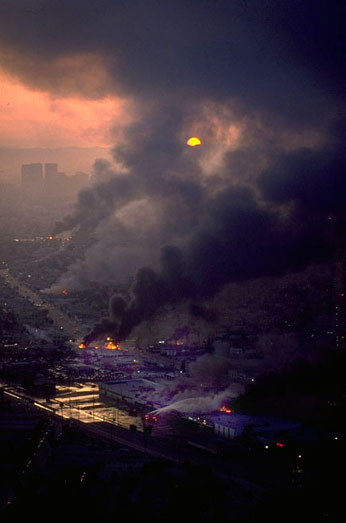 Four LAPD officers were later tried in a state court for the beating, but were acquitted on 29th April, 1992, sparking the Los Angeles Riots. Smaller riots occurred in other cities such as Las Vegas and Atlanta. A later federal trial for civil rights violations found two of the officers guilty and sent to prison, while the other two officers were acquitted. Top right: In addition to the immediate trigger of the Rodney King verdicts, a range of other factors were cited as reasons for the unrest. Anger over the sentence (five years probation) given to a Korean-American shop-owner, Soon Ja Du, for the shooting and killing of Latasha Harlins, a 15 year old African-American girl, on 16th March 1991, was cited as a contributory factor for the riots, particularly for the African-American/Korean-American tensions witnessed during the disturbances. Also fuelling tension was the extremely high unemployment among the residents of South Central Los Angeles, which had been hit very hard by the nation-wide recession, and the high levels of poverty there. 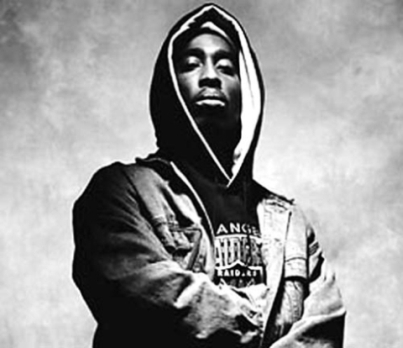 The video to 'Keep Ya Head Up' (1993) by 2Pac opens up with the words, "Dedicated to the memory of Latasha Harlins, it's still on." Second row (both photos): Thousands of people in the Los Angeles area rioted across a six-day period (29th April - 4th May 1992), following the verdict in the Rodney King case. Widespread looting, assault, arson and murder occurred, and property damages totalled approximately US$1 billion. 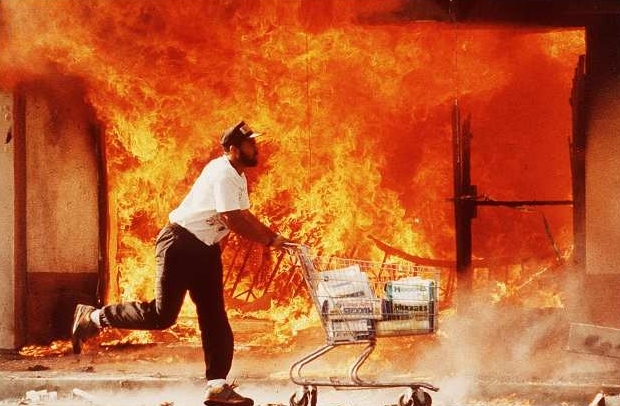 In all, 53 people died during the riots and thousands more were injured. 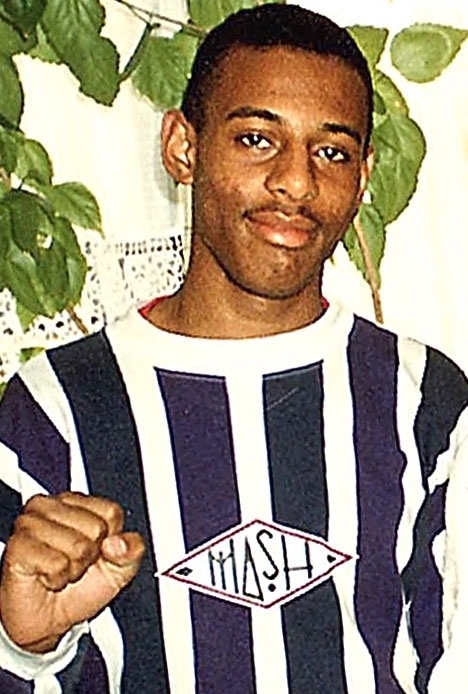 Bottom left: Stephen Lawrence, an 18-year-old sixth form student from southeast London, was stabbed to death in a racist attack while waiting for a bus on the evening of 22nd April 1993. Witnesses said he was attacked by a gang of white youths chanting racist slogans. After the initial investigation, five suspects were arrested but not convicted. It was suggested during the course of investigation that the murder was racially motivated, and that the handling of the case by the police and Crown Prosecution Service was affected by issues of race. A public inquiry was held in 1998, headed by Sir William Macpherson, that examined the original Metropolitan Police Service investigation and concluded that the force was "institutionally racist". It also recommended that the double jeopardy rule should be abrogated in murder cases to allow a retrial upon new and compelling evidence (this became law in 2005). Bottom right: Reni's post-Roses band, The Rub, wrote a song - Juris Prudence - which criticized the police and Crown Prosecution Service for its handling of the Stephen Lawrence murder investigation. 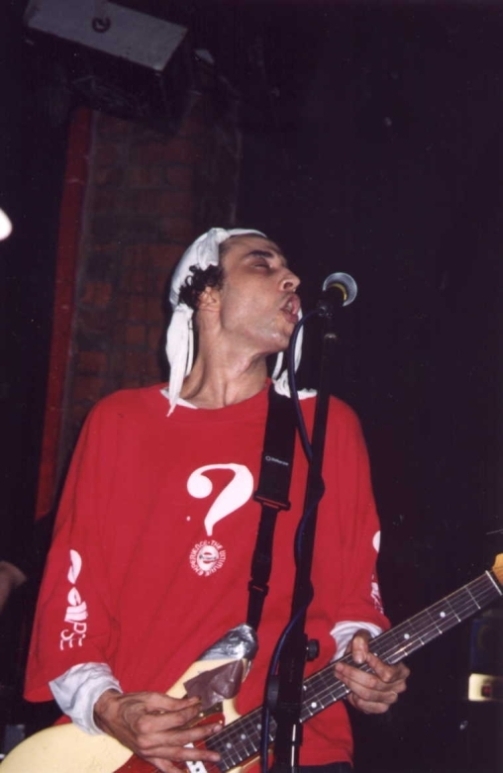 After leaving The Stone Roses, Reni withdrew from the music scene before forming The Rub in 1999, which he fronted (vocals, lead guitar), along with Casey Longdon (rhythm guitar), Neil Nisbet (bass), and Mick Grant (drums). Sometime Happy Mondays percussionist Lee Mullen was in the initial line-up. The Rub played only four gigs, all of which were in 2001, and released no official material. In May 2005, Reni gave his first broadcast interview in ten years, to the Manchester Music show on BBC GMR, along with Mani, whilst attending a gig by The Coral. In May 2005, Squire, Mani and Reni were spotted together at a Love with Arthur Lee concert, leading to speculation that a Roses reunion was imminent. Daybreak, the itchy aggressive guitar and Hammond organ workout with echoes of Buddy Guy and '70s prog-funk, grew out of a studio jam. As it was being arranged and recorded by the band, Brown heard what they were doing, ran upstairs to the bedroom above the control room and wrote what the band rate as some of his finest lyrics. It suited Brown ideally, as his preferred writing method is to initially ignore Squire's guitar, and instead take drum loops from the track, feel the rhythm of the loop and sing a melody over the top. Squire then listens to the vocal and adds the guitar overdubs, often completely changing the guitar melody to adapt it to Brown's vocal. It's a process that turns the conventional recording approach on its head. The African-American Civil Rights Movement developed in the late 1950s as earlier efforts by groups such as the National Association for the Advancement of Colored People (founded 1910) and the National Urban League (1911) became increasingly regarded as too gradualist and unsuited to overcome Southern white resistance to change. 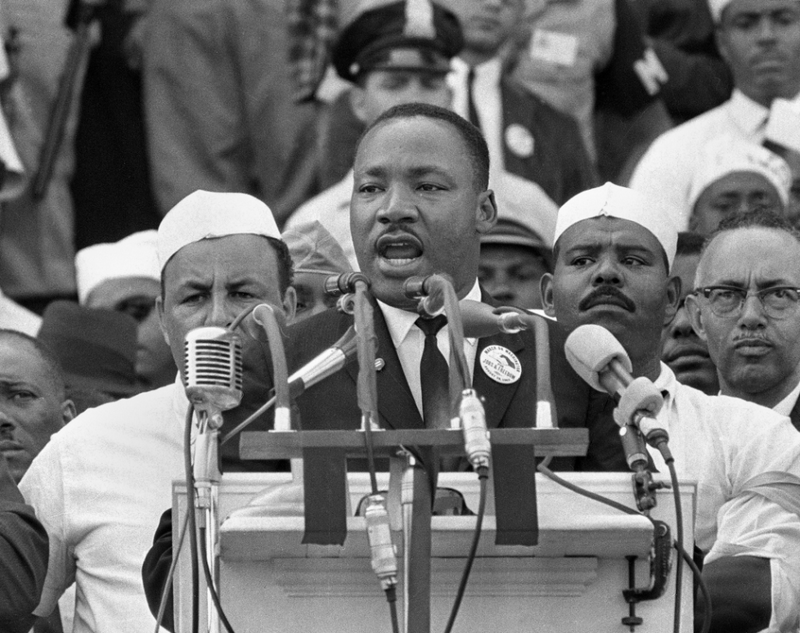 The movement was a coalition of organizations including the Southern Christian Leadership Conference led by Dr Martin Luther King Jr, the Student Non-Violent Coordinating Committee, and the Congress on Racial Equality. Its tactics included various forms of direct action, such as boycotts, sit-ins and marches; in the face of great provocation it tried to adhere to non-violence and the principles of civil disobedience, and to incorporate the support of white liberals. The movement achieved its greatest successes in 1964-65 with the Civil Rights Act and Voting Rights Act. However, it became increasingly disunited as some elements extended their claims from liberal demands for formal civil rights and electoral participation to a more radical prospectus for economic equality both within and outside the South. The fracturing of the movement's identity and the growth of more militant Black Power organizations occurred in 1965-66. 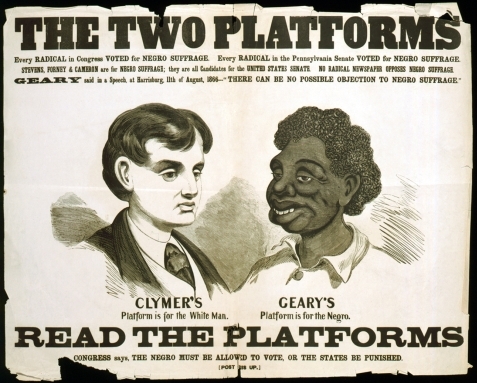 Top left: A racist political campaign poster from the 1866 Pennsylvania gubernatorial election. 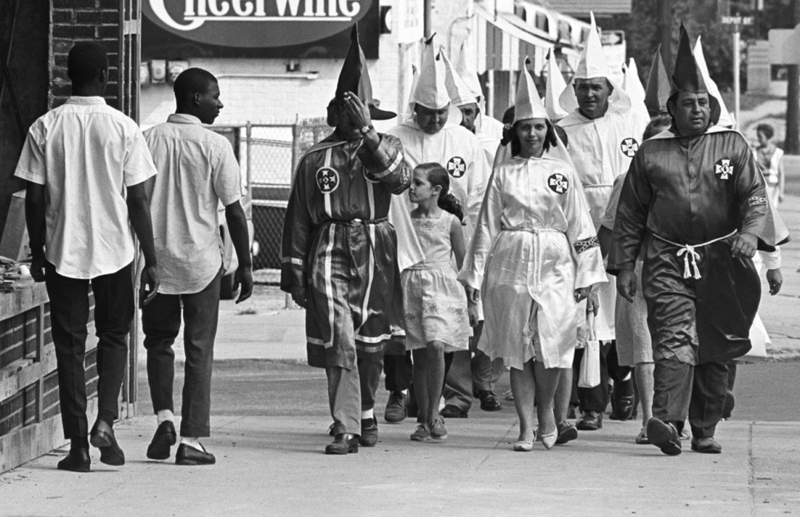 Second row: Ku Klux Klan marchers in downtown Salisbury, August 1964. The Ku Klux Klan was able to operate outside the law because in many communities, its members were the law. 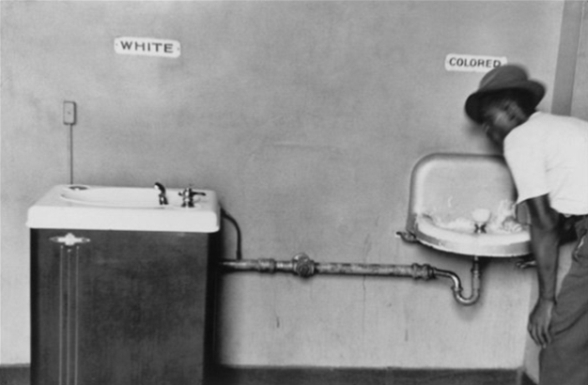 Third row (left): The Jim Crow laws were state and local laws in the United States, enacted between 1876 and 1965. They mandated de jure racial segregation in all public facilities, with a supposedly 'separate but equal' status for black Americans. In reality, this led to treatment and accommodations that were usually inferior to those provided for white Americans, systematizing a number of economic, educational and social disadvantages. 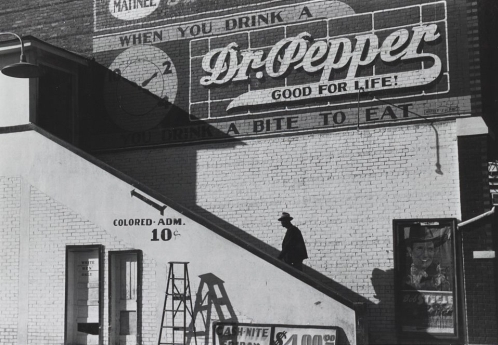 These segregation laws impacted upon all aspects of life: the U.S. military, public schools, public places, public transportation, restrooms, restaurants and drinking fountains. Even the prisons were segregated; "Desegregate this place ? It will be blood. Mixing white men with animals. 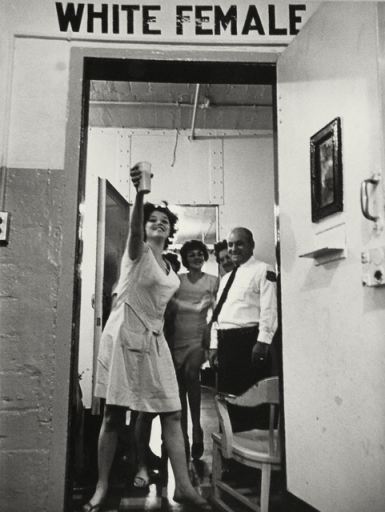 Can't make us do that", one guard commented to photographer Leonard Freed in Louisiana prison (right). 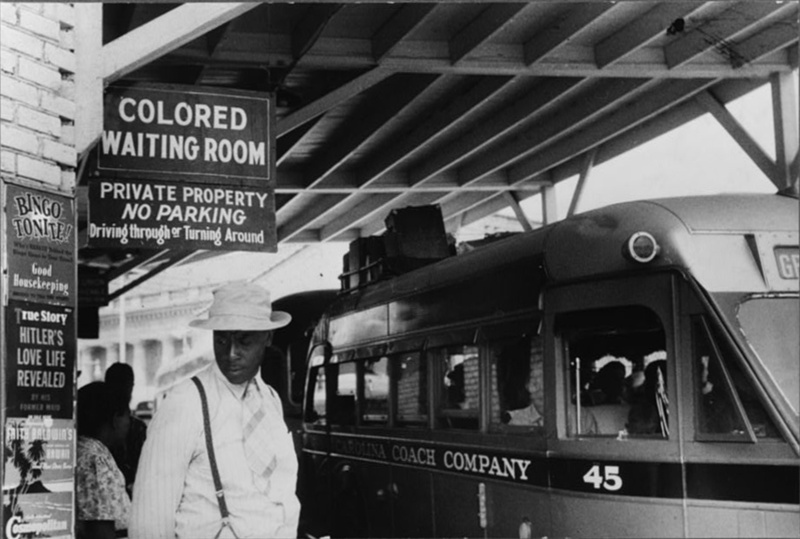 These Jim Crow Laws were separate from the 1800 - 1866 Black Codes, which also restricted the civil rights and civil liberties of African Americans. State-sponsored school segregation was declared unconstitutional by the Supreme Court of the United States in 1954 in the Supreme Court's Brown versus Board of Education decision. Generally, the remaining Jim Crow laws were overruled by the Civil Rights Act of 1964 and the Voting Rights Act of 1965. 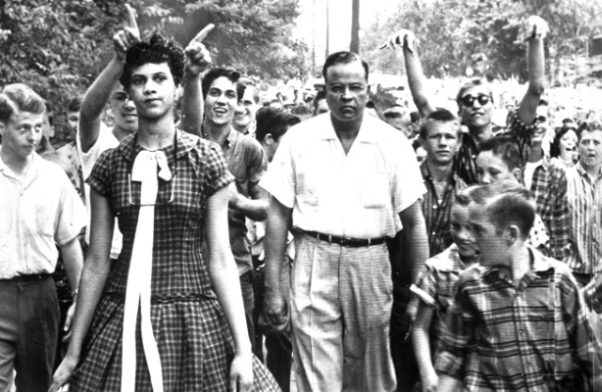 Bottom left: On 4th September 1957, 15-year old Dorothy Counts took a walk that broke the 'color barrier'. She was one of the first black students admitted to the newly desegregated Harry Harding High School, North Carolina, in the United States. After four days of harassment that threatened her safety, her parents forced her to withdraw from the school. The harassment started when the wife of John Z. Warlickthe, the leader of the White Citizens Council, urged the boys to "keep her out" and at the same time, implored the girls, "spit on her, girls, spit on her." Dorothy walked by without reacting, but told the press that many people threw rocks at her - most of which landed in front of her feet - and that many spat on her back. More abuse followed that day. She had trash thrown at her while eating her dinner and the teachers ignored her. The following day, she befriended two white girls, but they soon drew back because of harassment from other classmates. Dorothy's family received threatening phone calls and after four days of extensive harassment - which included a smashed car and having her locker ransacked - her father decided to take her out of the school. At a press conference, he said: "It is with compassion for our native land and love for our daughter Dorothy that we withdraw her as a student at Harding High School. As long as we felt she could be protected from bodily injury and insults within the school's walls and upon the school premises, we were willing to grant her desire to study at Harding." The family moved to Pennsylvania, where Dorothy attended an integrated school in Philadelphia. 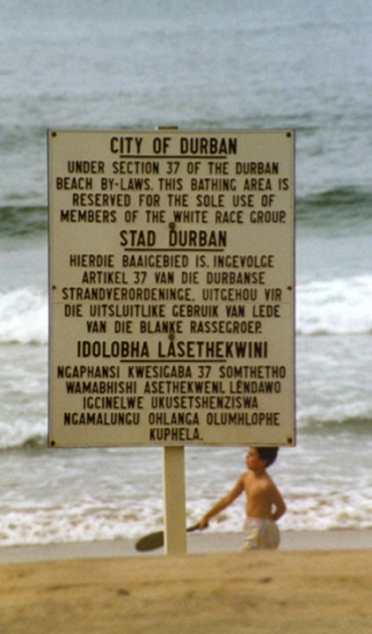 Bottom right: A sign in Durban, with notification (in English, Afrikaans and Zulu) that this beach is for white people only, under South African apartheid laws, 1989.